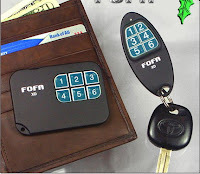 Okay, here's another cool gadget to give out this Christmas: Wireless key finder. I know a lot of people tend to lose their keys and wallets especially at very urgent times like when you're late for a meeting. The FOFA XD wireless device comes in two versions, a key fob and a credit card sized wallet version. You can attach these devices anywhere: keys, wallets, cell phones, remotes, etc. The FOFA XD wireless device doesn't come with a base unit, I think you have to get two devices so you can find the other. I think the company's idea is that you always lose the ones that you need most when you're late and find the ones that you don't so if you do find the one that you don't need, you just press a button to find the one that you're looking for. Seems kinda complicated especially for the unlucky ones who really can't find anything (me!). I mean, what if you're looking for both your wallet and your keys, how the heck are you going to find them without a base unit? So I guess the idea is that you have to buy at least 3 devices in order to be sure that you won't get stuck in the situation wherein both your units is not anywhere in sight. Oh well, I guess each company is entitled to use any strategy to sell their stuff.